When I was a kid, our home didn’t have air conditioning. The closest we came to that was a water cooler. On really hot summer days, when the concrete walls of the Navy residence we lived in soaked up the sunlight, my mother would put ice blocks into the water reservoir. Before she got the water cooler, she’d put a bowl of ice in front of a fan. We’d all try to sit in front of the fan but it was really only a one person space. The bowl of ice was, after all, in only one spot. At least the water cooler did a whole room. When those concrete walls released the heat they’d gathered at night time, though, there was nothing you could do but find a place in the backyard to sleep. The water cooler couldn’t keep up. So we’d drag our mattresses out onto the back lawn, which was actually quite nice, looking up at the stars, but you’d also get eaten alive by mosquitoes. My favorite way to beat the heat was when my parents decided it was time to go to the beach. That really didn’t happen until weekends because everyone had to go to work or school next day on weekdays, but when it happened, it was the best thing ever. My parents would drive us all to Frankston beach in their brand new black and white Valiant Chrysler, with red vinyl seats that smelled of plastic. You could buy a car for a few hundred pounds in those days. A house was only a couple of thousand, but I suppose that’s all relative. The standard wage was under two hundred a week and I could go to the local shops and buy a stuffed full bag of lollies for half a penny. Today, my grandkids would be lucky to find one lolly for a cent. We’d lay blankets down on the sand at the beach and put our pillows on them. Mum would bring the radio and play it, and we’d all eat fish and chips bought at a local kiosk, and watch people playing in the water. After the meal, mum and dad always left my sister and I on the blanket, to swim out to the sandbar in the deep water. My sister and I never went swimming on those nights. We were good girls who did what we were told, and we were told to stay near the blanket and go to sleep. We never went to sleep straight away but always spent time digging a big hole, first. (What is it about kids and digging holes?) We’d take turns to bury each other in the sand and then when we got sleepy we’d look for the little black heads of our parents far out in the water. It was always a puzzle to think why they stayed out there so long, but they always came back in, eventually. So we’d snuggle down on the blanket and wait for them. (Of course, I know the reason why they were out there so long today, but that’s another story). Back then, the world seemed to be a safe place, even though there are things we know now that we didn’t know at the time. I’m glad we were able to sleep on the beach, and that my parents didn’t feel they had to watch over us always, because I would have missed out on the waves. I loved the sound of the waves, the rhythmic crashing on the sand. I loved watching them come in and go out, and to see the sun go down and make them glisten with pink and gold. I loved lying on the sand at night and watching the stars in the dark sky, listening to other people also sleeping on the sand, and the ever present waves. 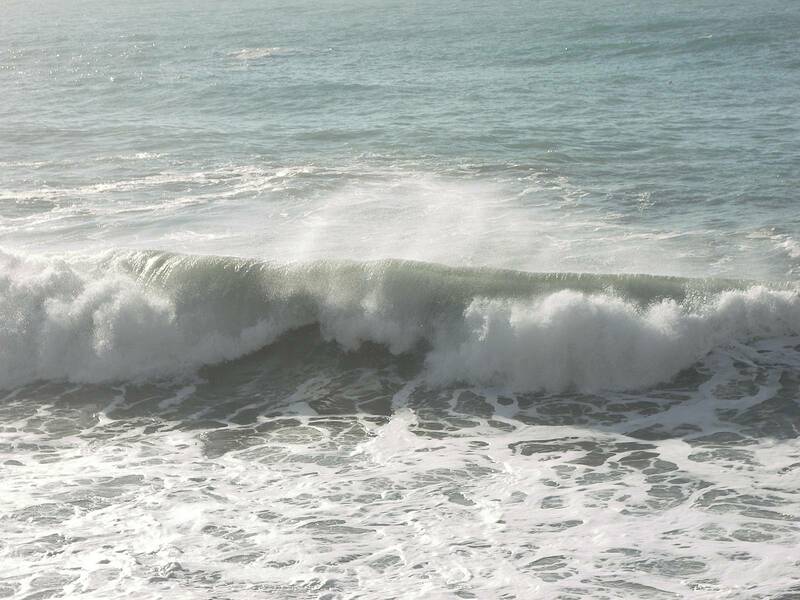 It was the most soothing symphony and even today I love listening to waves. (I even have a CD of wave sounds to play when I’m finding it hard to sleep). We woke with the dawn and the waves were still playing, now glinting grey and pink as the sun came up. Even after we had gone home, those waves stayed with me. The mood in our home was always great after a sleep on the beach, even if we had returned to our hot concrete box. Because of those nights on the beach when I was a kid, I always seek out the waves. When I was a teenager, my friends and I spent a lot of time on the beach. I wasn’t a great swimmer, but I did love jumping over and body surfing in on the waves. (You could get a lot of good exercise that way…) I think that the best times in my life are still whenever I’m near the ocean waves. After we got a car of our own, my future husband and I would often drive to the beach to have fish and chips, and watch the waves. The seagulls would come to say hello and ask for chips, and we’d get to see them squabble with each other. It’s always fun to watch seagulls, but they wouldn’t be the same without the waves. I like my waves on a beach, though, not out on open water. I went on a school excursion across the bay once. I thank god my mother’s husband was a sailor and that I had been on family trips on his naval ship, because it gave me a grounding for the experience of that day. My dad had told me to always keep your eyes on the horizon and that way you won’t get sick. Well, the swells on the bay were huge as our little boat crossed it, and every one of the kids on board were sick. Hell, they were sliding in vomit and not even the teachers were immune. The smell was so bad, it was making even those who weren’t seasick vomit but I kept my eyes on that horizon and I was the only one who did not succumb. I remember taking a trip up to Cairns with my husband in later years and getting on a hydrofoil ferry to check out the local islands. It also crossed a terrible rip during passage. The waves were twice the height of the boat. It would go deep down into their hollows, where you couldn’t even see the sky and then it would lurch upwards, like it was struggling to come up from drowning, and would sit on the peak for a moment before falling in again. I’m sure every passenger on board that day thought they were going to die, despite the reassurances of the staff – and again the smells of vomit assailed my nostrils, but what did I do? I laughed. I laughed and laughed and could not stop. It was very loud laughter. Anyone would have thought I was on a fun ride at a rollercoaster park. I think some part of me must have been hysterical, but you wouldn’t have known it. All I could think of was the day I was on that school excursion, so long ago, and every time I saw someone vomiting it made me think of those kids. Only this time, there was no horizon for me to keep my eyes on, except in short glimpses at the peak. I think I laughed so much because it stopped me vomiting. So, yes, I prefer waves at the beach. Gentler waves, too. When my kids were still young, we visited relatives at Bondi Beach in Sydney. There are beautiful orange cliffs there where you can look out over the ocean. My sister-in-law took us for a walk along them but I wasn’t happy about getting too close to the edge. The waves were crashing so high they were coming up in spray through weathered holes in the rock. My sister-in-law teased me when I told my kids to not go too close. My husband thought I was being overconcerned. So I resigned myself to their imminent deaths and kept walking. After we got back home from that holiday, there was an item on the news about a family who had been swept from those same rocks a week later. I was glad it wasn’t mine (though I pitied that poor family). Waves can be dangerous. During a rough period in my marriage, I went to live beside a beach for a while to get my bearings. Every day, I would walk on that beach for miles. I never got sick of the waves. Always changing, always smelling so good. Except when there was seaweed on the beach on a hot day. My kids loved the beach and played on it often. It was only a short walk from the house I’d rented. Their cousins would come to stay with us and would also go playing on the beach. They’d all take torches down to the beach at night and play hide and seek in the dark. My little dogs absolutely loved the beach, skipping in and out of the shallows and finding wonderful things to sniff among the driftwood. They were only tiny dogs and hated getting their feet wet on rainy days or their underbellies wet when going to the toilet in long grass but they loved the sea water. They loved the beach. Maybe they picked up on my enthusiasm for it. Living at the beach house then was good for all of us. My husband dated me while I lived there and life got good again. We both loved being there so much we tried to keep renting it even after I’d moved back home but the winters were so cold near the water, especially living in a weatherboard shack. We just didn’t get there as often any more, so in the end we gave it up. Life moved on. My Nanna hated the beach. She hated getting sand in her undies or having to wash sand off her feet. I thought that odd when I was a child but now I’m older I have to say I agree with that feeling. (Is that because I’m a Nanna now, too?) I still love the waves. I’m glad there are so many concrete paths and boardwalks beside the beaches, these days, so I can still experience the sounds and the smells without having to go onto the sand. There are still times when I go down to the water, though. There’s nothing that can replace standing in the shallows with the water washing around your ankles. It’s the most soothing feeling in the world – even better than the foot massages my husband likes to give me. It’s an experience worth having to wash sand off your feet for. After my youngest son was disabled in a traffic accident, we spent a long time helping him learn to walk, talk, and even eat again. We would go places and do things to help him re-engage with life. I forgot about how much we did back then. It’s so long ago now. He had his accident when he was thirteen, and he is now in his thirties. We found an old movie clip we made of one such excursion. There was my husband and my eldest son carrying my youngest son into the surf and my daughter and I watching from the beach. The waves were strong and I was concerned they were going out too far, that they would not be able to cope holding onto my youngest son’s disabled body and still manage to keep themselves upright. I was so afraid they were all going to be swept away any moment. The Gold Coast beach where we had gone was known for its strong undertow and crashing waves. Even as I watched that video clip, I relived that tension from the time. I just wanted to save my family. Then they came back out of the water, and all my men, disabled son included, were grinning from ear to ear. Sometimes risks are worth the results. We live not too far away from beaches, these days. So when we go for a drive, I always find a route that takes in sea views, and when we stop for a rest it’s usually where I can see and hear the waves. I dream of having a beach house of my own one day, but my practical self reminds me of when we lived in the shack and how cold it got each winter. So long as I can visit sometimes, to refill my soul, I’m happy. what a wonderful sound, when thee waves crushes on the beach, i love that.